Our standard turnaround is 7 to 10 working days, depending on the workload of the individual reporter. If you are in need of expedited service, please let our scheduling department know. When Ordering Copies, What Will I Receive? A printed transcript and tabbed exhibits, unless otherwise instructed. An e-mailed electronic copy of the transcript in the following formats (full-sized pdf, 4-pages-to-a-page pdf, wordlist, text file, ptx (Etranscript), and scanned exhibits conforming to original exhibits (black and white and/or color) in pdf format broken out by exhibit numbers. The taking attorney will also receive an original signed deposition transcript approximately 35-plus days after transcription, unless the witness has waived the right to read and sign. In that case, both and original and copy will be forwarded at the same time. Will We be Billed for Travel/Mileage? We are the only agency in Idaho with statewide coverage, so in most cases there is no charge, although there are a few remote areas that are exceptions. If you are unsure of location charges, please ask when scheduling. Can M&M Help with Scheduling Out-Of-State Depositions? We certainly can. We work with many agencies and can help make arrangements for you. Does M&M have In-House Videographers? Yes, and we offer all services, including the synchronizing of video and text. Are All M&M Reporters Certified? Yes, Idaho has a CSR requirement. See Reporter Credentials. Yes. You can access that by going to www.idahocourtreporting.com for statewide coverage. Are All Transcripts/Exhibits Available Via the Internet? Yes. We maintain an online repository for 24-hour access at www.idahocourtreporting.com. If you do not know your username or password, please e-mail us and that information will be forwarded to you. Can We Receive Electronic Copies Via Tables/Cellphones? Yes, all e-mail notifications for transcripts contain a url link to a downloadable file for Blackberry, Androids, iPads, and iPhones. There are three categories evaluated in the speed skills test, each lasting five minutes: Literary at 180 words per minute (WPM), Jury Charge at 200 WPM, and Testimony (or questions and answers) at 225 WPM. The reporter must obtain a 95% accuracy rate in each of these three parts in order to pass. Reporters have 75 minutes to transcribe each of the three parts. After completing the RPR test, reporters must maintain this certification by renewing NCRA membership and completing continuing education requirements as mandated by NCRA. The Certified Realtime Reporter exam tests a candidate's ability to write realtime at 180 words per minute. The test is 5 minutes in length and it must be passed with a 96% accuracy rate. No typographical changes can be made by the candidate. It is turned in as written. 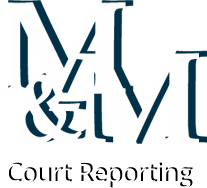 The RMR, Registered Merit Reporter, is the second highest certification offered by the NCRA, or National Court Reporters Association, for court reporters. There are two parts court reporters must pass in order to obtain an RMR: a written knowledge test and a speed skills test. A reporter must also already have an RPR certification. There are three categories evaluated in the speed skills test, each lasting five minutes: Literary at 200 words per minute (WPM), Jury Charge at 240 WPM, and Testimony (or questions and answers), at 260 WPM. After completing the RMR test, reporters must maintain this certification by renewing NCRA membership and completing certain requirements as mandated by NCRA. There are currently approximately 3,000 Registered Merit Reporters in the United States. A reporter must already be a Registered Merit Reporter. Also, the reporter must have six continuous years of membership with NCRA. Unlike the RPR and RMR, there is only one part a reporter must pass in order to obtain an RDR: a written knowledge test. There are currently over 350 Registered Diplomate Reporters in the United States.